via orbits throughout the Solar System. Simulate earth gravity via continuous spin around longitudinal axis. to provide power for production and life support requirements. of surface area for living quarters, agriculture and other needs. Habitats can transfer payloads to Mars via transfer orbits. Once there, habitats could house Martian humans in orbits about Mars. Martian habitats could even share same Martian orbits as Martian moons. and likely provide considerable construction materials. Many agricultural items produced in habitat can transfer to Martian surface; such items can help terraform Mars over many years. Eventually, Mars (both surface and subsurface) will prove to be an expansive source of agriculture and raw materials. However, Mars is unlikely to ever reproduce Earth like gravity; longitudinal spin of the cylindrical habitats can produce 1-g via centrifugal force. Martian humans will always prefer to live in the large orbiting habitats; conditions will be more "Earth like" and access to interplanetary travel will be much easier than for the Martian humans who choose to reside on Mars itself. 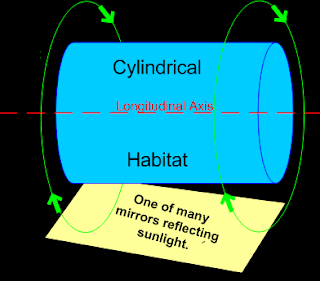 from longitudinal spin of cylindrical habitat. habitat has to get there. to travel from Earth to Mars. PROBLEM: During lengthy space voyages, humans require plentiful supplies: food, water, oxygen as well as Earth like gravity. None of those are now available in current space vehicles. Infrequent, interplanetary flights are now accomplished by Artificial Intelligence (AI) devices inside small capsules. Sending humans in such vessels seems pointless; not only would travelers have to endure months/years of 0-g conditions which would likely permanently disable them; but providing required consumables would be challenging at best. SOLUTION: On the other hand, interplanetary flight conditions could greatly improve if humans traveled on habitats during these lengthy missions. Habitats can be very comfortable "homes" during lengthy flights. Power supply via sunlight from large external mirrors. Onboard water stores and agriculture provide oxygen and food. Centrifugal force from longitudinal spin provides 1-g gravity. Large human population provides essential social interaction. Constant communication with "home planet" reinforces purpose. As a matter of fact, habitats might be necessary for the several years required for trips to other planetary systems: Jupiter and moons, Saturn and rings and moons, Uranus, Neptune, perhaps even the planetoids such as: Pluto, Ceres, etc. Transfer Orbit (TO) is a highly eccentric orbit between two planetary orbits. 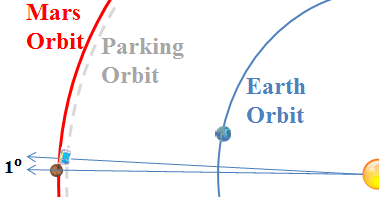 A non-powered object must use a transfer orbit to travel between planetary orbits. The most efficient transfer orbit is a Hohmann Transfer (HT), which uses least possible fuel for "burns" to enter/exit TOs between orbits. For HT from Earth to Mars, the perihelion (nearest point to Sol) is the exit point from Earth's orbit and its aphelion (farthest point from Sol) is where it intercepts Mars. HT Aphelion(QHT) is the semi-major axis of Mars, a♂. HT Perihelion (qHT) is semi-major axis of Earth, aⴲ. After 259 days of unpowered flight, habitat reaches destination aphelion. Vehicle emits a controlled thrust to orbit destination planet. At departure perihelion, vehicle emits controlled thrust to exit Earth's orbit and enter transfer orbit. Transfer must begin when properly planned. of the semi-orbit from qHT to QHT. For reference (θ = 0°), consider a ray from Sol to perihelion, qHT. 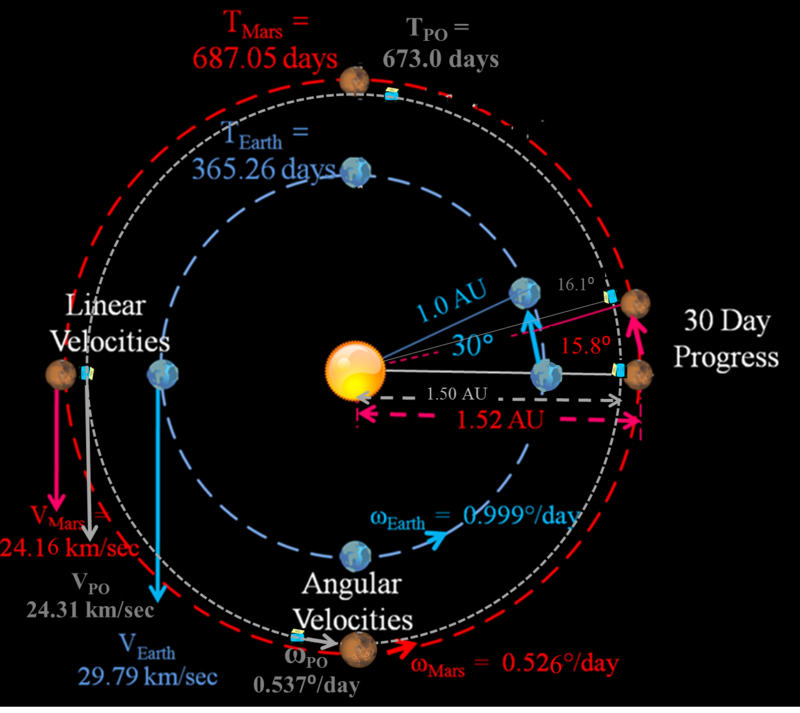 As Habitat orbits from qHT to QHT, angle, θ, goes from 0° to 180°. Compute radius, distance from Sol to Habitat, for each angle, θ. In the plane of the Transfer Orbit, define a 2 dimensional (X,Y) coordinate for each θ.Use Sol as origin (0,0). and convert distance from AU to kilometers. Use point velocity to approximate incremental travel times. Velocity for any angle, θ.
are the most energy efficient transfer orbits. Hohmann transfer time is easily calculated. use HT time as a typical transfer orbit duration. for any angular position during transfer semi-orbit. takes durations of 43 days, 95 days and 167 days respectively. for each degree of habitat's transfer. via cumulative travel times as shown. Source table contains all cumulative values for θ = 0° to 180°. in an elegant but much more complex method. 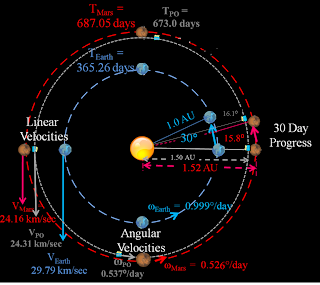 Ideal transfer orbit goes directly from Earth to Mars. However, it requires a precisely timed "launch window" of a few hours once every 758 days. To do this, habitat must enter Hohmann Transfer (HT) exactly as Mars leads Earth by 52.7°. This precise position happens one time during each Earth-Mars Synodic orbit (about 758 days). This is a great opportunity for that one day out of 758; however, this requirement seems to prevent travel to Mars during the other 757 days. TE considers this to be too restrictive. To slightly expand launch window, consider a "Parking Orbit (PO)". For circular orbit, a is constant distant from Sol. For Mars, a♂ is 1.52 Astronomical Units (AU). 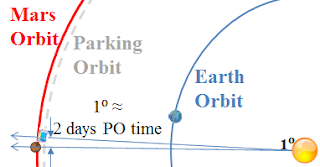 Let parking orbit (PO), aPO , be 1.50 AU. 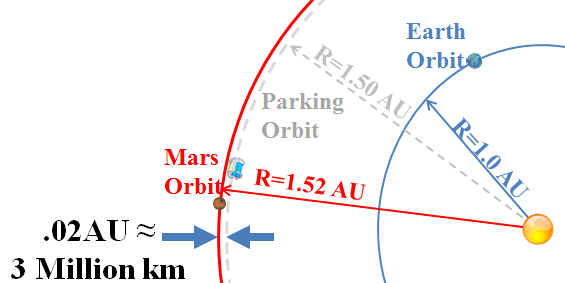 Assume orbits (Mars and PO) to be concentric and about 3 million kilometers apart. Object in inner orbit (PO) will travel slightly faster than Mars. directly from a, semimajor axis. Divide total circumference angle (360°) by orbital period (in days). With Habitat in the smaller, quicker orbit, it will daily decrement difference between Habitat in Parking Orbit and Mars in its orbit. If Habitat is 1° behind Mars, Habitat will completely align with Mars in about 91 days. Even when aligned with Mars, Habitat will still be in smaller orbit and displaced from Mars about 3 million kilometers. 1) During the 91 day catch up period, Space Tug could gradually nudge Habitat closer to Martian orbit, perhaps daily nudges are best. 2) For each daily nudge, the habit assumes a slightly larger orbit and thus closer to Mars orbit, unfortunate when Habitat's orbit gets slightly larger, it also gets slightly slower with an even smaller daily differential. Thus, total transit time (from PO to MO) might take 100 days. CONCLUSION: HT and subsequent PO might be a good "last resort" for limited fuel scenarios. However, if fuel is available, compute direct transfer orbit instead of HT.